This is one ultimate iOS App if you are into exercises like running, jogging, walking, biking etc. RunKeeper from FitnessKeeper Inc. has been updated to include new features that allow you to keep track of your own and your friends’ progress on social networking sites. The new update also lets you compare your previous records over the current information. - See detailed stats around your pace, distance, and time. - Get stats, progress, and coaching through your headphones with built-in audio cues. - Listen and control your music while you work out. - Measure your heart rate with many available sensors. - Take pictures along the way to share and save while you go. - View a detailed history of your activities to see how you are doing. - Get notified when you hit new personal bests and milestones. - Measure your progress against your goals and targets. - Follow detailed plans to help you achieve specific fitness objectives. - Turn any activity into a route to do again later. 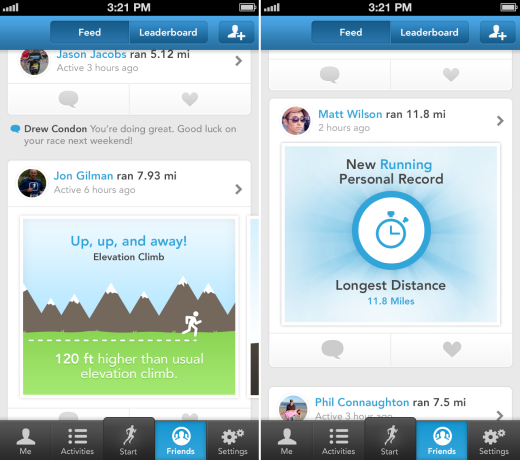 - Post your activities, achievements and plans to Facebook, Twitter and your friends on RunKeeper.com. - Let supporters watch LIVE maps of your workouts and races as you go (must subscribe to RunKeeper Elite). - Integrate your activity data with more than 70 other apps and services including Fitbit, Withings, Zeo, Garmin and many more, to get deeper insight into your overall health. RunKeeper uses heavy dosage of GPS which can drain your battery life considerably. To download RunKeeper visit Apple Store here.